The 1990s were a time when the design and decoration of living rooms became more delicate. 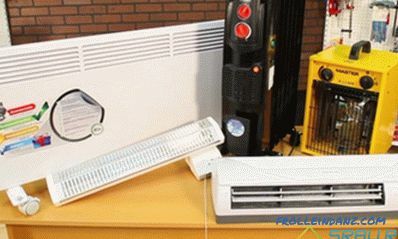 The bright colors of the 70s and 80s were replaced by more muted shades, such as beige and white. 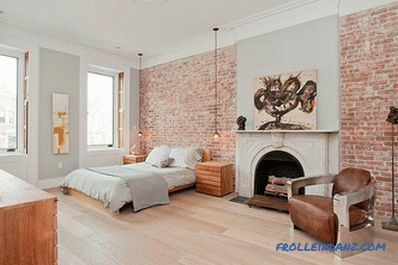 Simple, straight lines of eclectic interiors have become popular again. But, as you know, fashion is cyclical, old trends return sooner or later. The style of the 90s has become uninteresting to modern homeowners: the color and textural contrast and many styles that go beyond the ordinary come back. And it is precisely this mini-revival that once again opened up the beautiful brick wall to the design world! 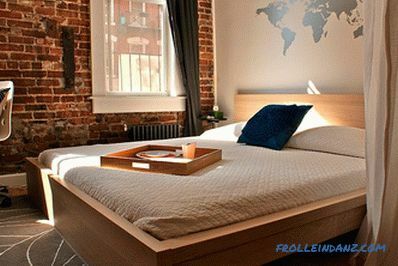 Today you will see the best bedrooms, the main advantage of which are open brick walls. 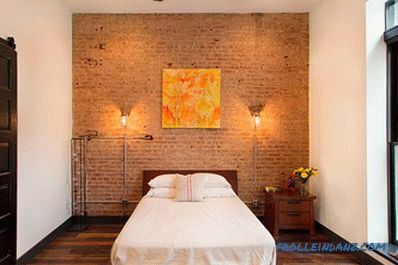 The brick wall in the bedroom offers much more than just a contrast, often it provides the highlight that you need. 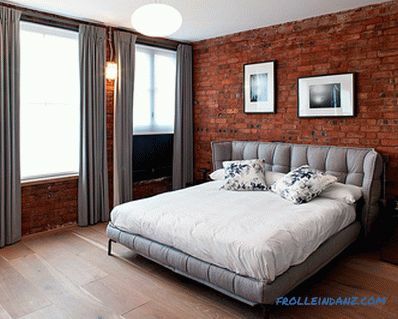 There are many reasons to love brick walls in bedrooms, the issue is not limited solely to their aesthetic magnificence. This trend is largely due to practicality: many architects and interior designers across the globe are increasingly resorting to adaptive reuse of old structures. 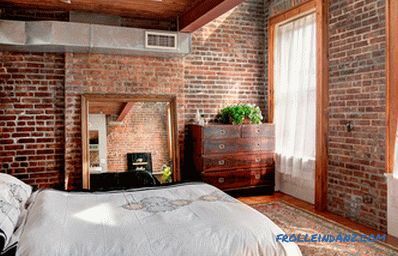 For homeowners who want to turn an old factory, barn, warehouse, or even a church into a beautiful, elegant and unique apartment building, the brick wall is again in the spotlight. 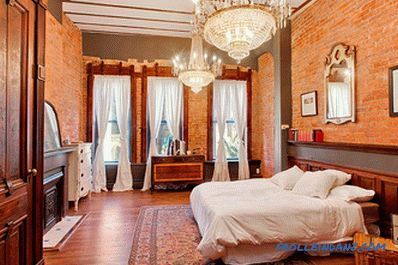 The brick wall in the bedroom is a treasure that can be shown with pride and panache. 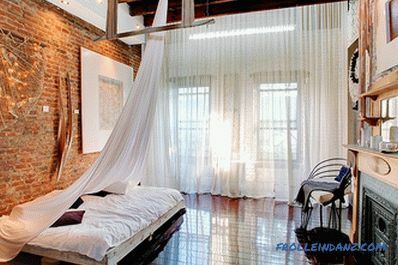 Delicate transparent curtains contrast well with rough, uneven brick walls (from Laura Dante Photography ). 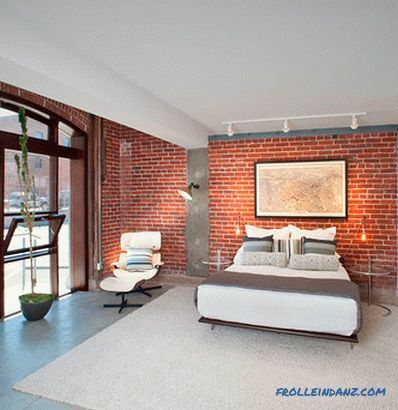 Suspended lamps and bedside tables emphasize the industrial style of the bedroom (from Robert Jenny Design ). 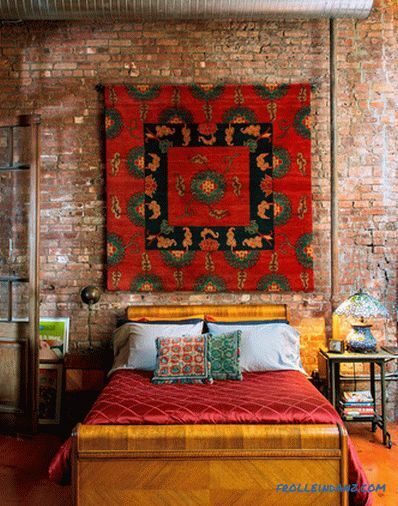 A bright and beautiful Tibetan carpet on the wall of an eclectic bedroom in one of the houses in New York (from Ralo / Trevor Tondro ) . 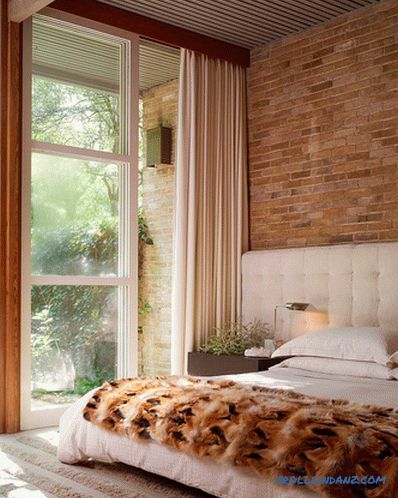 The stream of natural light creates delight in those living in this bedroom (from Jason Roehner ). The frame mirrors and window frames create a feeling of uniformity in this bedroom (from David Cunningham Architecture Planning ). 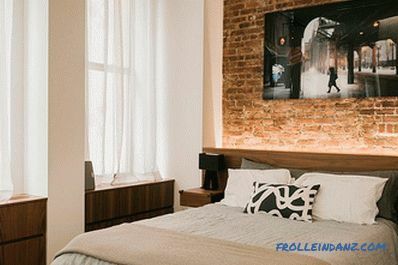 It is hard to deny that a brick wall seems very appropriate in industrial bedrooms, where there are elements such as exposed duct pipes, large windows with metal frames and bare wooden beams. A brick wall is an integral part of this story, and any interior in an industrial style without it will definitely seem incomplete. 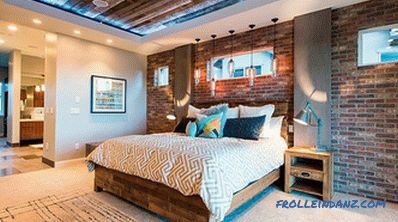 Of course, if you wish, you can create a softer and more comfortable atmosphere in these industrial bedrooms by adding light strokes of the modern and following the path of the industrial-chic. 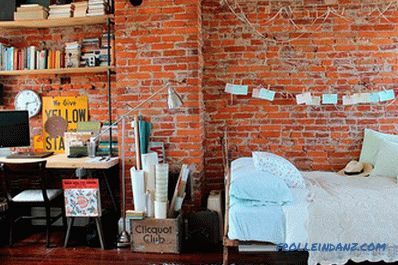 If your bedroom already has a brick wall, the amount of work to be done will obviously be significantly less. 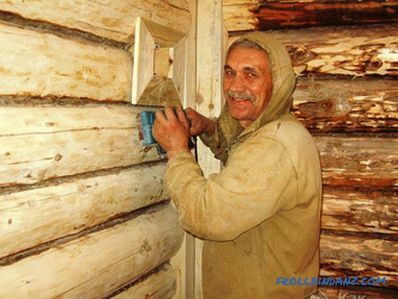 All you need in this case is to clean the masonry a little and apply a layer of sealant, which will prevent the destruction of the brick over time. 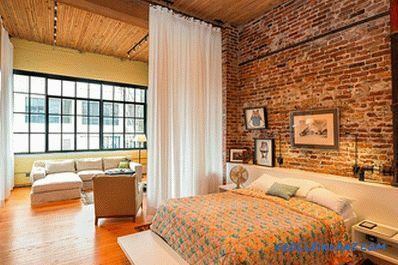 You can choose a common sealant or one that will give the brick wall a glossy shine and thus make it more suitable for a modern bedroom. 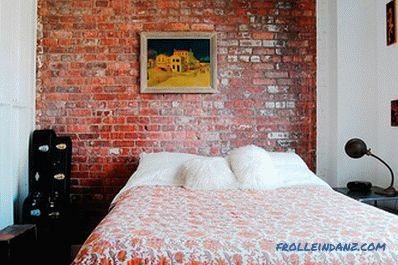 You can opt out of the natural orange-reddish hue of the brick and paint the wall in a color consistent with the color palette of the rest of your bedroom. Bedding, lighting, carpet and small details of the interior give this bedroom an atmosphere of femininity (from Twelve Chairs ). 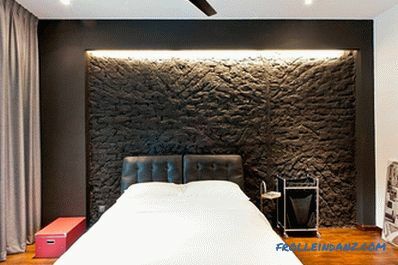 Randomly placed huge picture looks great in this dark, chic bedroom (from Yo Dezeen ) . 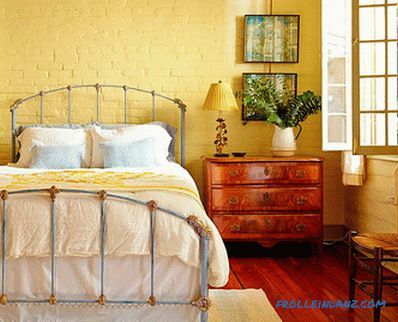 Yellow adds a blurry shine to this eclectic bedroom (from Logan Killen Interiors ). 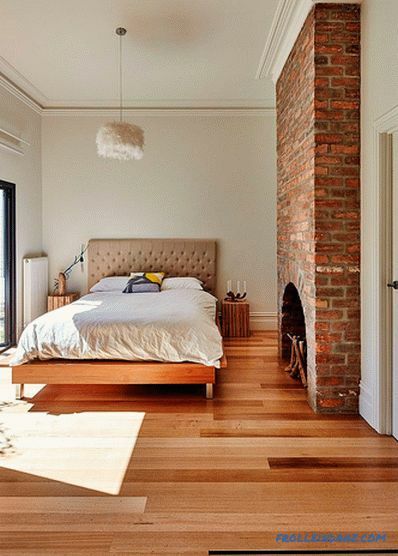 Nothing better than this gray brick wall can create in the bedroom a feeling of refined comfort (from Tom Stringer Design Partners ). 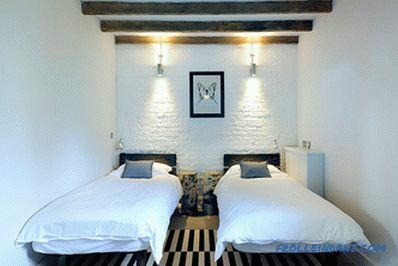 A dark brick wall in the bedroom, highlighted with the help of properly arranged lighting (from Architology ). 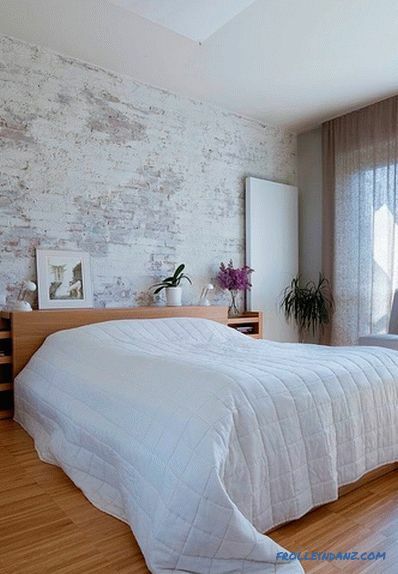 White is the perfect choice for a brick wall in a modern bedroom. This color gives the room a cheerful mood, lightness and a sense of spaciousness. Keep in mind that painting a brick wall will require more layers of paint than usual due to the porous structure of the brick. 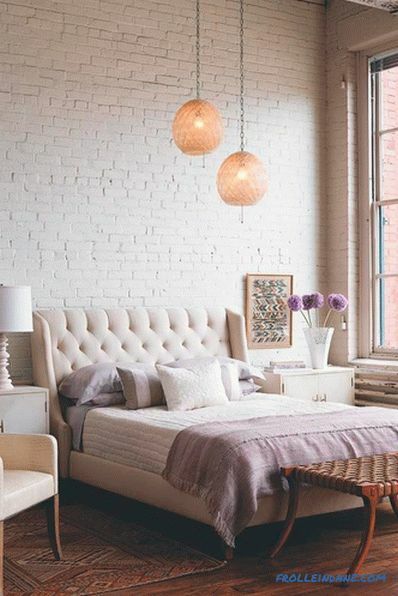 A whitewashed brick wall also looks no less stylish - a surface is born that seems to be truly aged and rustic in a rustic way.The next in the list of preferred colors for a brick wall is gray, it is most often used in modern bedrooms. 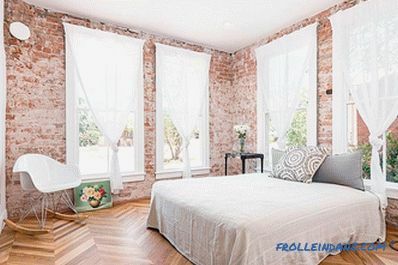 When decorating a bedroom with bricks, do not dwell on the walls alone. 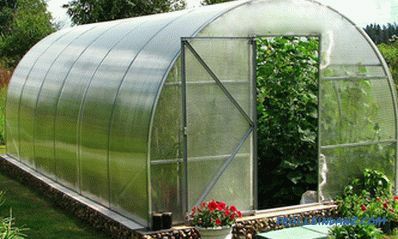 Go to the issue of decoration, as if you were designing the interior of any other space. 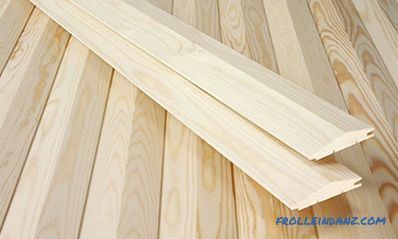 If you pay too much attention to the uniqueness of the walls, there is a risk that they will “take over” the space completely and begin to dictate the style of the interior. 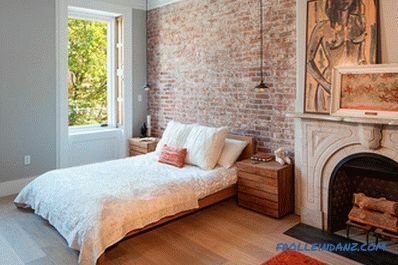 However, if your bedroom has a lot of temporary and transient elements, then, it’s possible, an accent brick wall is all you need. Let the rest of the room "evolve" in a natural way, with decor and favorite accessories. 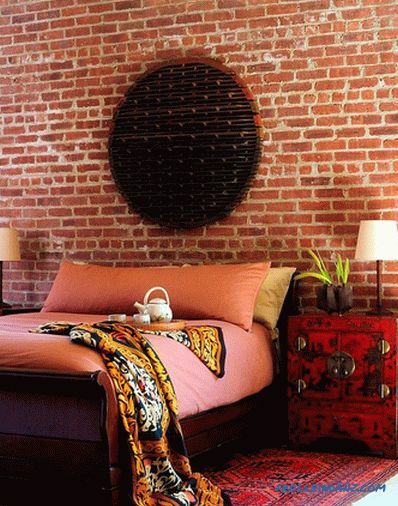 A wonderful way to make a stylish bedroom with brick walls (from Horchow ). The mirror doors of the wardrobe will make the bedroom more spacious visually (from S. K Interiors ). 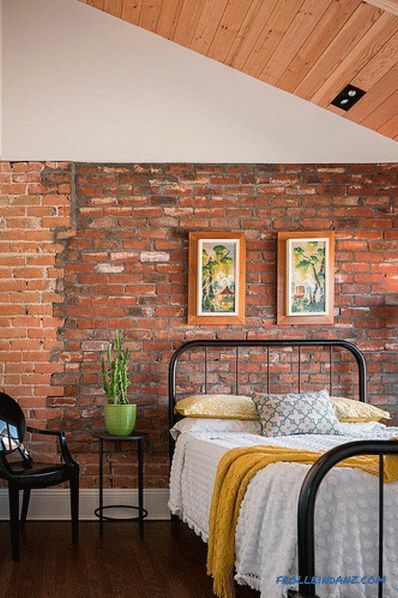 A magnificent wooden ceiling and brick walls in the bedroom (from Canyon River Homes ). 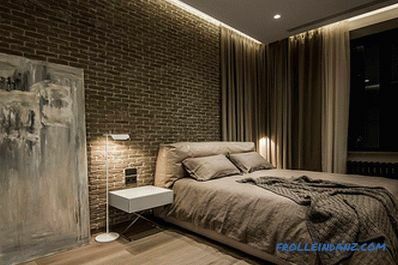 A sophisticated way of using bricks in the interior of a bedroom (from Porcelanosa USA ). 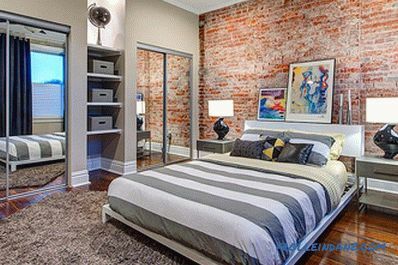 If in the bedroom you are surrounded on all sides by brick walls, break this monotony with wardrobe closets, large mirrors or even randomly placed works of art placed on the floor that will distract your attention. 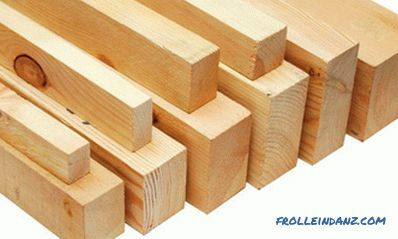 This will destroy the tedious type of continuous brick walls and create an atmosphere of elegance and comfort in the bedroom. 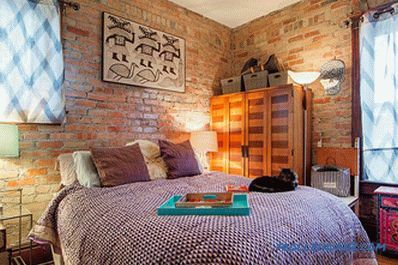 In a small bedroom, an open brick wall is even more attractive because it brings an atmosphere of warmth and comfort to a modest room. The correct strategy here will be to choose a monotonous appearance (which we did not advise doing in large rooms), which will avoid visual fragmentation. One of the options for implementing this strategy may be to paint the accent brick wall white so that it “blends” with the rest of the room. 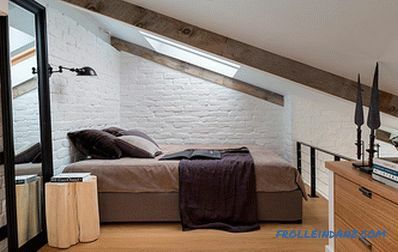 A tiny white bedroom located in the attic (from KRAUZE Architects ). 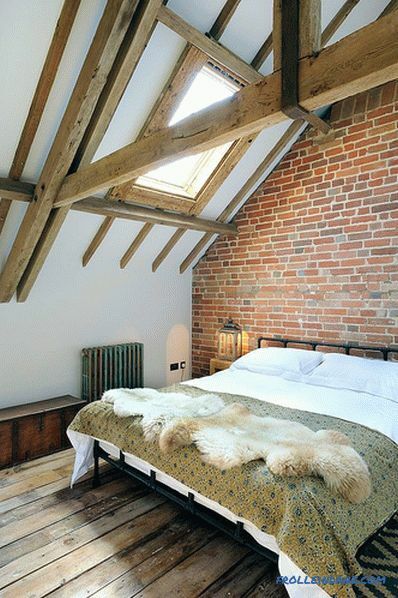 Bedroom with an open brick wall and Scandinavian atmosphere (from Laura Garner ). 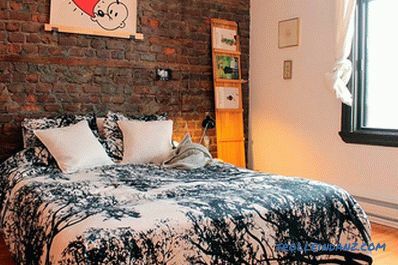 An eclectic combination of decor and artwork in a small bedroom (from Lucy Call ). 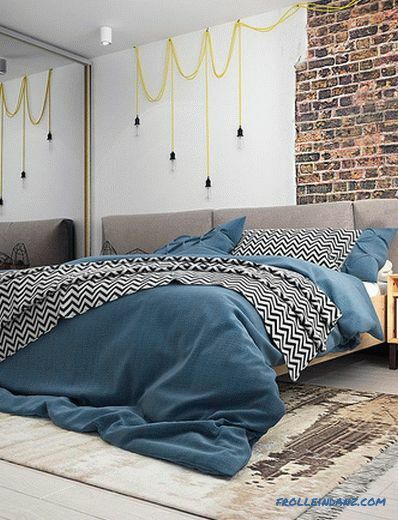 Modern and rustic styles, united in a modest bedroom (from PAD studio ). 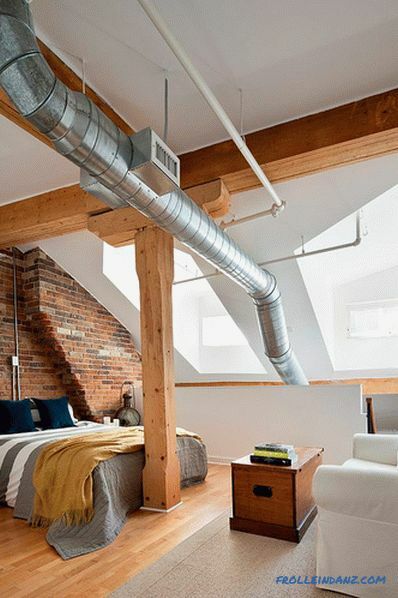 A small bedroom in an industrial-industrial style (from Corynne Pless ). 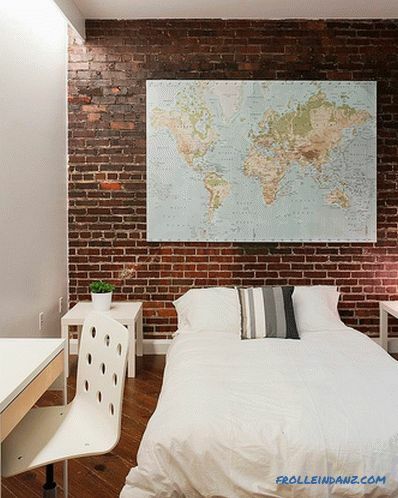 The opposite approach is to make a brick wall in a small bedroom the center of attention - it also works from time to time, especially when you need a unique wall at the head of the bed! 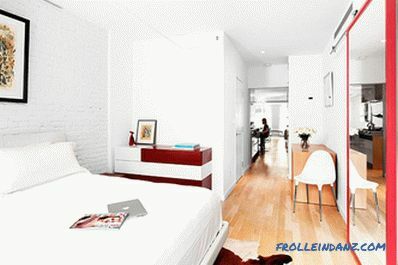 Once again make a reservation, what works in one small bedroom may not seem so impressive in another. 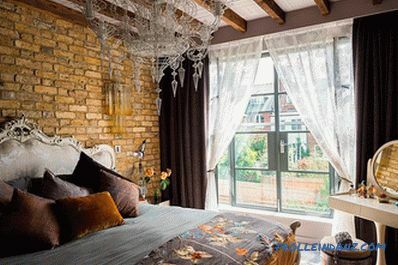 Be creative when working with a brick wall in your bedroom, think about using non-standard styles and decorations. Your bedroom is a private space, which, unlike the living room or kitchen, allows you to experiment with styles. Use it to your advantage. Here you have the opportunity to express yourself. Perhaps you are an avid graffiti artist and want to demonstrate your talent on this brick wall! 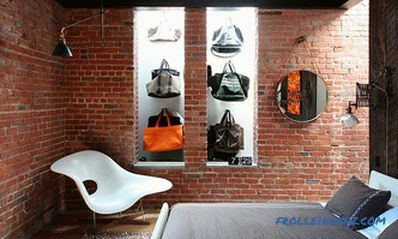 You can go the way of placing on the brick wall wireless monitors, works of art and bright lighting. Whatever your choice, do not be afraid to go beyond the boundaries! 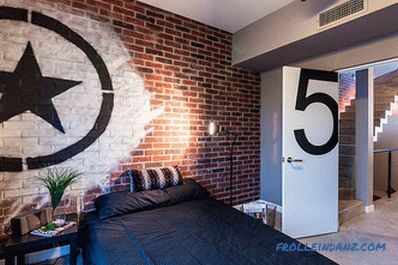 Be a rebel with graffiti in the bedroom (from CityLoft ). 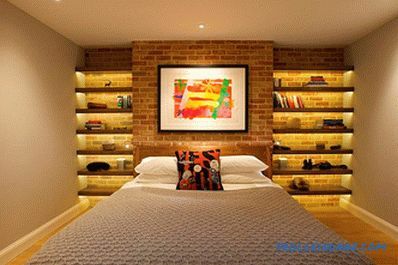 Turn the brick wall in the bedroom into a magnificent architectural feature (from Sian Baxter Lighting Design ). 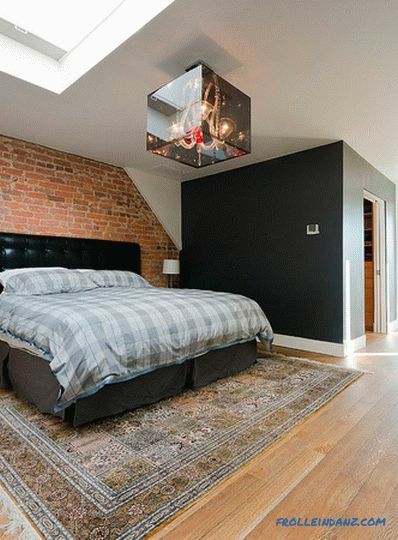 The chandelier overshadows everything in this modern bedroom (from BlackLAB architects ). 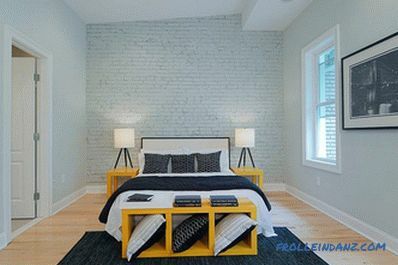 Gray adds modern elegance to a bedroom with brick walls (from Peter Landers Photography ). Removed from under the layers of finishing materials brick in the interior of the bedroom (from Sexton Development ).